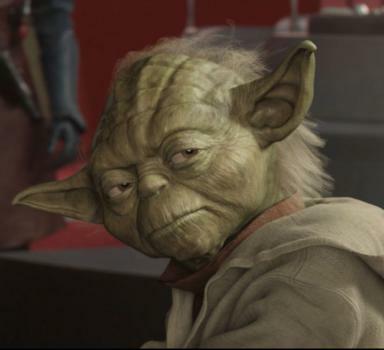 Did Yoda suspect Palpatine before the Clone Wars? Palpatine: ...that the situation is that serious? (pause) Oh, but I do, Senator. Padmé doesn't confirm that Palpatine "guessed" right and Palpatine seems absolutely sure that he knew what she was going to say - obviously, since a Sith lord is certainly capable of doing that. Yoda gives Palpatine a glare, which I interpret as 'suspecting'. Did Yoda suspect Palpatine already at this stage being a Sith lord or even a force-sensitive human? If he did, why didn't he discuss it with Obi-Wan or Mace or anyone? If he didn't, why the glare? According to the film's official novelisation, Mace Windu and Master Yoda have been discussing the possibility of someone close to the Chancellor being a Sith Lord, in line with Dooku's admission in the previous film. With what could only be described as a truly stunning lack of judgement, they ruled Palpatine out of consideration almost immediately, reasoning that he's too powerful to be a truly bad guy or he'd have already done something bad. There's no indication that at the earlier meeting (in AotC) that they had any serious suspicions that Palpatine was a dark Force user or that he was anything other than a power-hungry politician par excellence. Not the answer you're looking for? Browse other questions tagged star-wars darth-sidious attack-of-the-clones yoda or ask your own question. Why did Chancellor Palpatine create the Clone Wars? Why does Yoda call it “The Clone War” immediately? Why didn't Yoda/Palpatine press on with attack? Why did Yoda and Palpatine talk about Anakin? How did Palpatine learn Yoda was on Moraband? Does Palpatine know that Yoda is dead in Return of the Jedi?